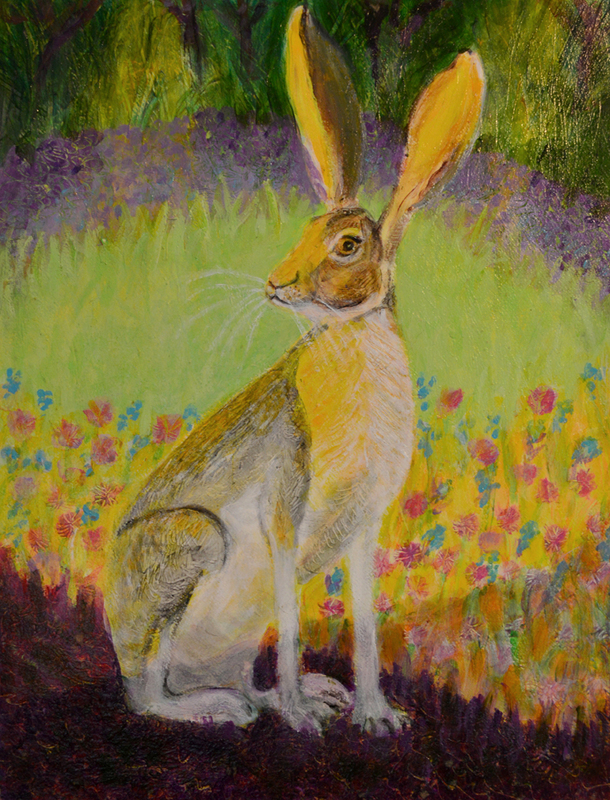 Jack Rabbit at Dusk is my most recent painting, I’ve been working on it for a couple of weeks now. Jack rabbits are well adapted to their dry grassland habitat with their large ears, long lanky front legs and big powerful rear legs. I find their looks strange and striking. Years ago, my twin sister and I bicycled across the country. We left in early June just after my sister’s college graduation, it took us two months to bike from Georgia to crossing over the Golden Gate bridge into San Francisco. Until this adventure we had never been west of Alabama. I have been thinking about that trip lately. I love biking, the slow pace and being out in the elements. I remember traveling through the country roads, enjoying the feel of the sun, the wind, the sounds, smells and sights of the places we traveled through. On our journey as the days went on, we began to realize that dusk and dawn were magical times when all of nature came alive with the birds and insects beginning their serenades against the backdrop of the orange sun low in the sky making long shadows that stretched across the landscapes. One late afternoon having made it into the Idaho countryside we began to set up camp in a potato field. As dusk approached suddenly out of nowhere several jack rabbits started appearing in the fields around us. They came from all directions. We had never seen a jack rabbit before, they didn’t seem to be bothered by our presence. They were huge compared to the eastern cottontail rabbits we were used to seeing. It was such a surreal moment, and so beautiful with the low sun and shadows dancing on the jack rabbits. I will never forget that experience. This painting doesn’t really do it justice but I wanted to try. I am fairly pleased the him and hope you are also. I’ve just completed Pegasus, a new painting to add to the mythic creature series for my Heni’s Happy Paintings Etsy Shop. 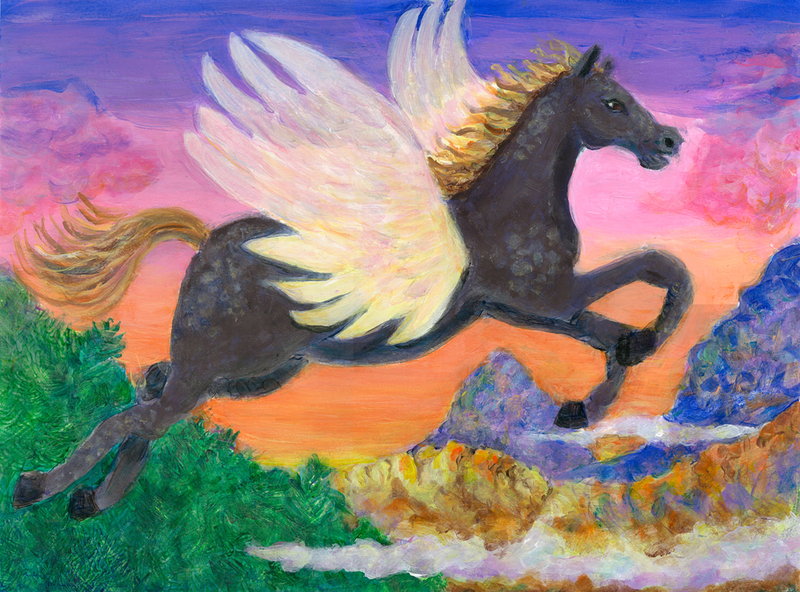 Instead of painting a white Greek Pegasus, I thought it would be fun to paint an Native American born appaloosa horse flying over the southwestern mountains at sunset. According to Greek mythology, Pegasus was born from the blood of Medusa as she was beheaded by Perseus. He guarded sacred places. 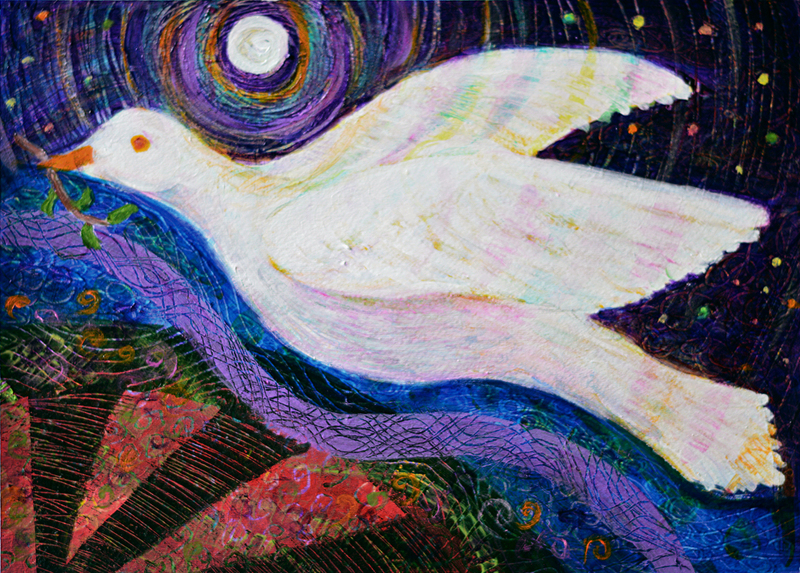 As a spirit guide he represents the creative power in all of us. 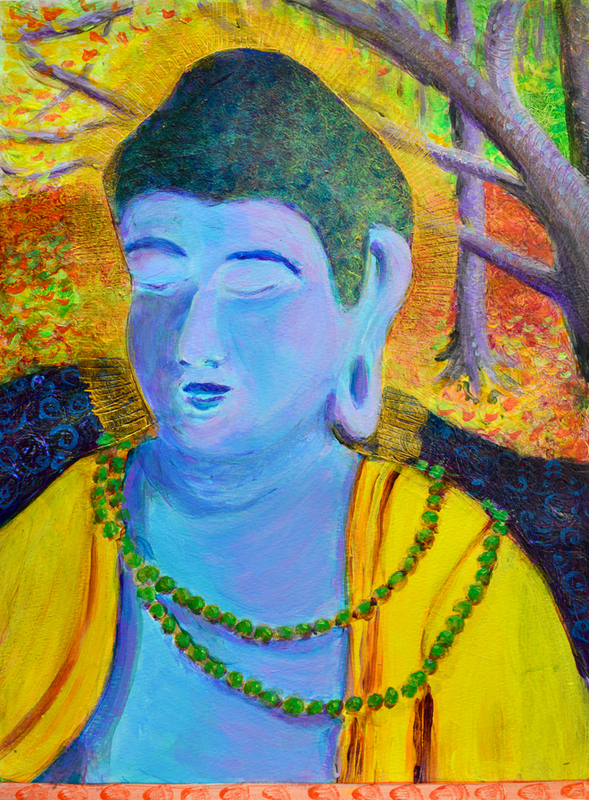 He symbolizes the beauty we bring to ourselves and others. 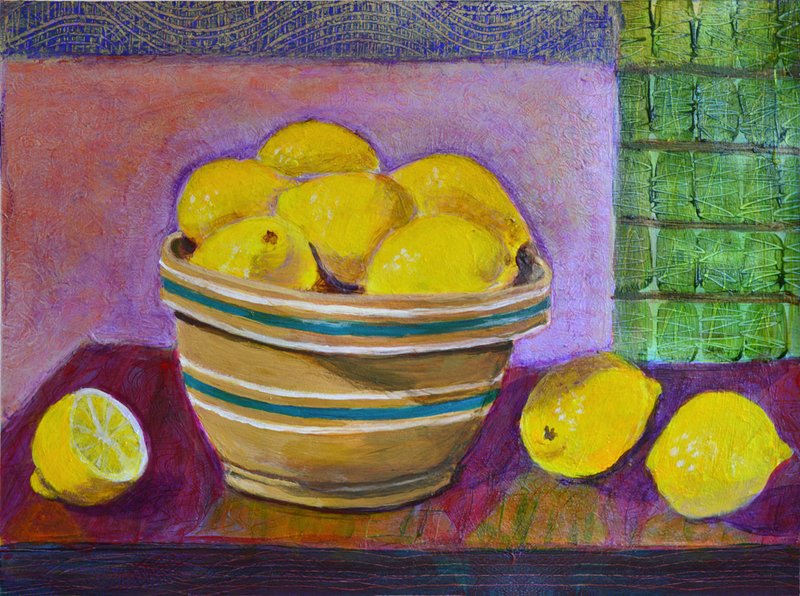 I’ve just completed Lemons in Mom’s Antique Yellow-ware Mixing Bowl in honor of my Mom’s birthday which is on January 27th. It was fun to paint a formal still life that I think she would have liked. She had several antique yellow-ware bowls and used them daily in her cooking. I remember mixing many batches of chocolate chip cookie batters in her large bowls. Mom loved to cook and so did Dad. These days they would have been known as “foodies.” Our life growing up revolved around food. Together they made breakfast every weekend which varied from waffles or corncrakes to homemade biscuits, scrambled eggs and grits. It seemed like most weekends they had dinner parties at which Mom tried out new recipes from her women’s magazines and cookbooks. The holidays were always about the special meals. From black-eye peas, greens and cornbread on New Years; leg of lamb and mint sauce on Easter; and barbeque pork from Dad’s big smoker outside on the 4th of July. On our beach vacations we had seafood feasts nightly. Christmas was all about the food. From the oranges, special cheeses, plum pudding and Virginia ham that arrived on our doorstep to all the special dishes and desserts that mom and dad would prepare. I have fond memories of going with Dad to the seafood store to pick up our yearly bushel of oysters. On Christmas Eve we had oyster stew, which my sisters and I hated when young but grew to love later. The big event was Dad making the traditional Virginian eggnog in one of the big yellow-ware bowls. Mom was a northern girl and she served cow tongue, corn beef and sauerkraut, and ham with spoon bread and lots of casseroles and steamed vegetables that still retained their color. My southern friends all thought our food was weird. I was not a picky eater and loved it all. Through Mom I learned that cooking is fun and to enjoy all kinds of food. Thanks Mom! 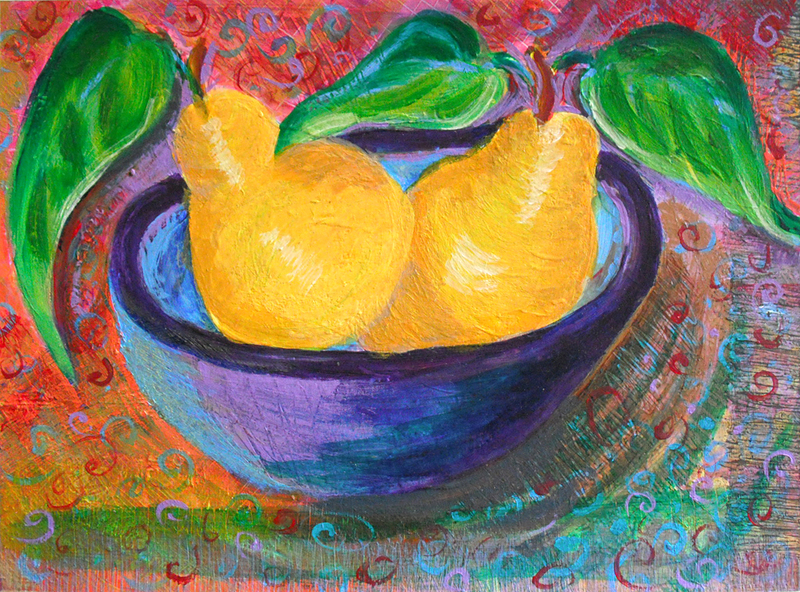 Mexican Jumping Pears is one of my early pear paintings. I chose the name because the colors and the bowl reminded me of Mexico. The pears look like they are celebrating, almost jumping out of their bowl with the colorful movement all around them. Today I feel like celebrating, yesterday my girl completed her college applications. She has already gotten accepted to UGA which is no small feat and has now applied to two private Northeastern colleges. She worked diligently to get them done. The teens these days work so hard with their demanding school work and their extra activities. I’m glad that she can now can relax and see what happens. My husband and I are happy and very proud of her, wherever she ends up. 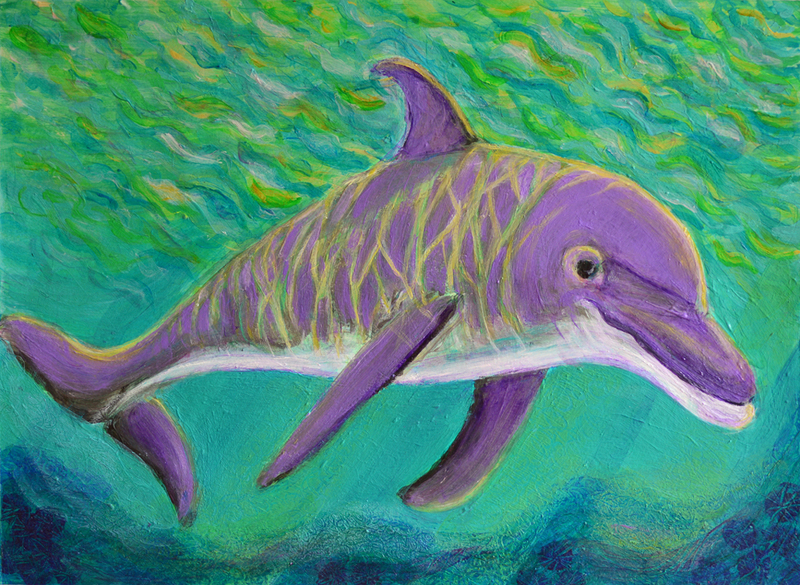 I’m looking forward to getting back to my painting routine and hope that everyone is off to a happy start to 2015!